De Laszlo made his third visit to the United States from October 1925 until early 1926. He had not been there since 1921 and was in high demand from illustrious clients in New York and Washington, D.C. Among those he painted during his visit were President Calvin Coolidge , Andrew Mellon , Adolphus Ochs , proprietor of The New York Times, and George Eastman , founder of Eastman Kodak. The present portrait was painted in New York, the first sitting taking place on 13th January. The portrait was completed in consecutive sittings over the following three days. Ellice Mack was born 5th April 1892 in St. John’s Wood, London, to John Mack (1855-1933) and Maude Winifred Laycock (1860-1944). Her father worked in the publishing trade and his brother Robert Ellice Mack was a writer and editor of children’s books. 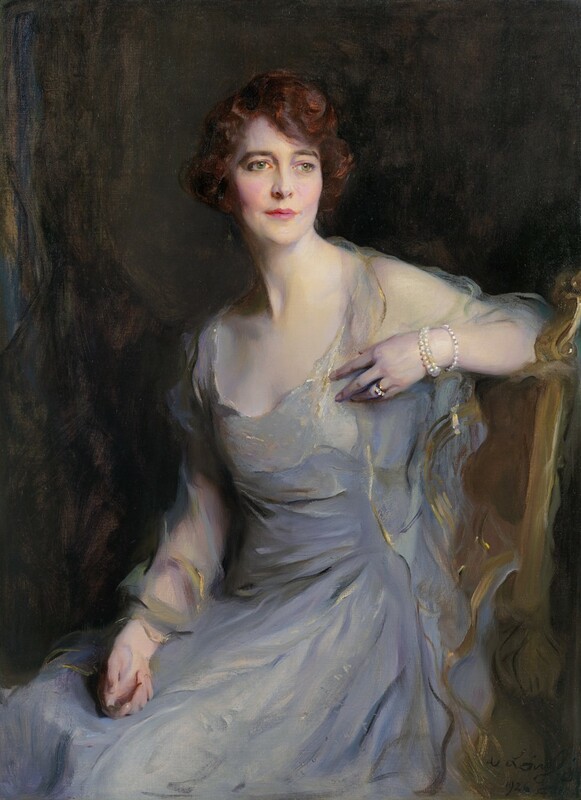 According to the New York Times, the sitter was an “English stage beauty” at the time she met her husband Lieutenant Colonel William Endicott III (1865-1941) of Boston, son of William Endicott, Jr. and Annie Thorndike Nourse. During the First World War he served as American Red Cross Commissioner to Great Britain. They married at St Paul’s Church in Hampstead, London, 27th March 1919. Shortly after their marriage, Endicott resigned his commission with the Red Cross, and they moved to Boston, where he resumed his duties at the banking firm of Kidder, Peabody, & Co. In 1920 they purchased a home at 274 Clarendon, in the Back Bay area of Boston, where they lived until his death in 1941. The couple also maintained a home in Pride’s Crossing, Beverly, Massachusetts. In later years she was a serious amateur painter (see White Horse, Atkinson Art Gallery, Southport), exhibiting at the Mai Salon in Paris, the Alpine Club Gallery and the Royal Academy of Arts, London in 1961. She died 25th April 1973 and is buried at Central Cemetery in Beverly, Massachusetts. The seated, three-quarter-length portrait format was prevalent in de László’s work of this period, affording a longer, more luxurious view of the sitter’s clothing and accessories. With masterful brushwork the artist beautifully captures Mrs Endicott’s ethereal, diaphanous grey silk gown, with chiffon wrap trimmed with gold. The position of her left arm resting on the back of a chair, enables the artist to echo its gilded ornamentation in the undulating, golden lines of the wrap, as well as highlighting her pearl bracelet and diamond ring. We are grateful to Katherine Field, Senior Editor of the de László catalogue raisonné, for her assistance with the cataloguing of this work. Philip de László was one of the most stylish and successful portrait painters of the late nineteenth and first half of the twentieth centuries. Like John Singer Sargent (1856-1925), he was an exponent of the fluidly-painted ‘swagger portrait’, but always managed to capture a sense of the sitter’s interior life, sometimes with a tinge of romantic melancholy. He portrayed the glamorous European high society that was rent asunder by the First World War and the leading figures of the era that succeeded it. Born Fülöp Elek Laub in 1869 in Budapest, the son of a tailor, Philip de László began his studies at the Hungarian National Academy of Arts under Bertalan Székely and Károly Lotz. In 1890 he won a scholarship to study in Munich at the Akademie der Bildenden Künste with Sándor Liezen-Mayer. He also studied briefly at the Académie Julian in Paris. De László’s first works were highly detailed genre and history paintings, but he soon turned to portraiture and became one of the most fashionable artists of the Austro-Hungarian Empire. He portrayed Emperor Franz Joseph I in 1899 (Hungarian National Gallery, Budapest) and in 1900 a hugely successful exhibition in Berlin led to commissions from the German Royal Family. In 1900 de László married Lucy Guinness from the renowned Irish banking family and in 1907 they moved to London, where de László received many commissions from the British aristocracy. In 1908 de László visited the United States to paint President Theodore Roosevelt (American Museum of Natural History, New York), a trip which brought commissions from several other wealthy Americans. He was appointed MVO by King Edward VII in 1909. Briefly interned on suspicion of spying for Austria during the First World War, de László continued throughout his life to paint portraits of some of the most famous and influential figures of the twentieth century, including the Duchess of York (the future Queen Mother), Princess Elizabeth (the future Queen Elizabeth II), Andrew Mellon, Benito Mussolini, Arthur Balfour and Jerome K Jerome. Strongly influenced by the work of Velásquez, de László wrote in 1936: ‘the picture must show us the spirit by which the human form is vitalised…it must provide the sitter with the surroundings and atmosphere which are suitable to his personality and consistent with his state of life’. The work of Philip de László is represented in the Royal Collection, London; the National Portrait Gallery, London; the Hungarian National Gallery, Budapest; the American Museum of Natural History, New York and the National Gallery of Art, Washington DC. ‘Colonel William Endicott, a well-known banker of Boston, U.S.A., in London, last week married Miss Ellice Mack, daughter of Mr John Mack, of Hampstead and Bristol. Until March 15 Col. Endicott was Commissioner in London for the U.S. Red Cross. He is a direct descendent of the William Endicott who sailed in the Mayflower, and became the first Governor of Massachusetts. After the wedding at St Paul’s Church, Hampstead, Col. And Mrs Endicott left for Paris. The Prince of Wales attended a dinner given recently in London in honour of Col. Endicott. In his speech he said: “The United States always seems to get the right man in the right place; she never did so more happily than when she sent Col. Endicott to take charge of American Red Cross interests in London during the war.” ‘An American Red Cross Wedding’, Western Daily Press, Bristol, 31st March 1919, p.5. ‘Women in Sport’, Illustrated Sporting and Dramatic News, 21st August 1926, p.490.